A healthy breakfast that tastes like dessert! Mix all the ingredients in a jar. Cover and place in the fridge overnight. This recipe is written for 1 serving, but you can make up to 5 of them at a time. If you like a smoother oatmeal, use rolled oats. If you prefer a crunch, use steel cut oats. These can be eaten hot or cold. I prefer mine cold. Enjoy! Dessert for breakfast for me and the kids? Sounds good to me. German chocolate is the best. When the family goes out to eat, I always order German Chocolate cake and wife will say she doesn't want dessert (watching her weight) and then eat all of mine when it comes! So maybe we can all just eat this for breakfast instead and not fight over dessert. I hope you enjoy my version. :) My husband is a huge German Chocolate fan too. I am going to make this for tomorrow. 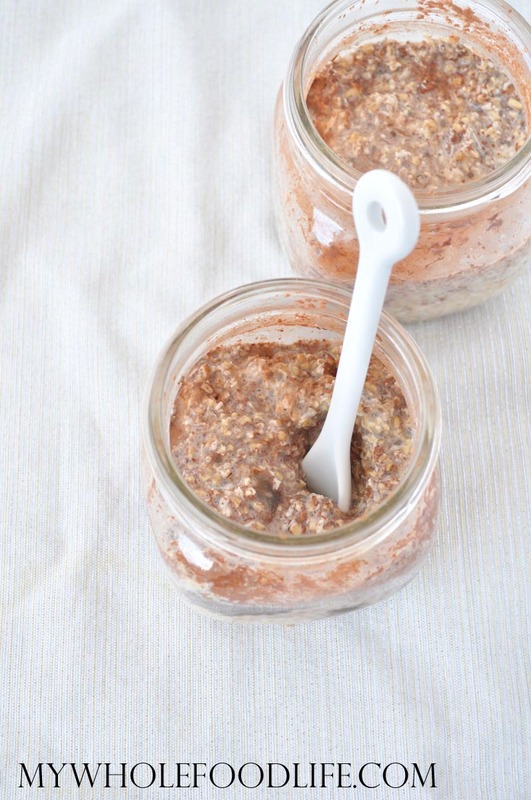 Make overnight oats all the time and love them first thing in the morning. Thank you for another great recipe!! Sounds so good--love German Chocolate!! I'm sorry I don't know them. You can plug in any recipe to My Fitness Pal and get a rough estimate though. Jewel - I made this without the pecans, and added another 1/2 cup of cashew milk in the morning. They worked out to be about 320 cals, 55 carbs,9 protein and 10 fibers. Hope this helps. Melissa - thanks for another great recipe. I love german chocolate cake - one of my favs, right up there with carrot! This was tasty!! Thank you! You can puree them to make a paste if you prefer. Or you can sweeten with honey or maple syrup. Just made two servings for my husband and I for tomorrow morning. As with all of your recipes, I just know we will enjoy this one too! Glad you liked them! Yes, the whole thing needs to be stirred up well. This recipe is also very versatile to add whatever you like in.